"People don’t normally come just to see the compere. But this one, Lewis Bryan, was worth the visit alone. A rapid fire audience worker"
"Lewis Bryan, who was also on the bill, is one to look out for. Slightly depressed delivery with a good intelligent use of language...I for one would love to see him again." "You are an absolutely brilliant compere – at one stage I was laughing so much I had to stop filming you . Our audience absolutely loved you too and as I said last night – I have never asked for a compere to come back on stage at the end. I just wanted to make sure that you got the applause you deserved. You have a beautiful balance of instilling fear into the audience and desperation to be talked to and you certainly turned them into one of the liveliest we’ve ever seen. All in all a fantastic night out. Can’t thank you enough." "The compere was Lewis Bryan, a seasoned wrangler of audiences across the UK who had the crowd settled and at their ease within minutes. Throughout the show he would become a fantastic act in his own right, his playful banter and well-judged ribbing of the audience keeping everyone in the laughing mood." Many years ago Lewis started out as an actor, performing in several musical theatre and drama productions, notably for New Peckham Varieties (now Theatre Peckham). Lewis attended a stand up comedy course at The Comedy School , run by Keith Palmer in 2003, and has been performing Stand-up comedy ever since. Lewis is a regular compere, performer and Promoter working with a number of comedy providers across the UK and beyond. 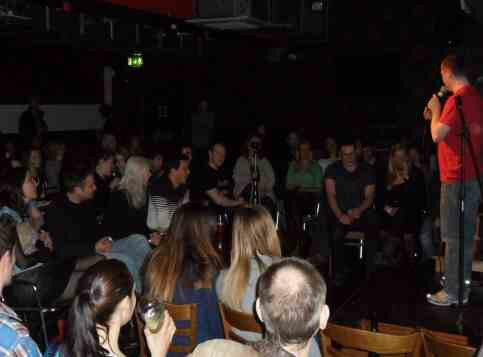 Lewis runs www.standupcomedynights.co.uk supplying comedians for events across the UK.